60% of financial institutions in North America believe that big data analytics offers a significant competitive advantage and 90% think that successful big data initiatives will define the winners in the future. More than 70% of banking executives worldwide say customer centricity is important to them. However, achieving greater customer centricity requires a deeper understanding of customer needs. Research from Capgemini indicates that only 37% of customers believe that banks understand their needs and preferences adequately. The truth is that financial institutions are struggling to profit from ever-increasing volumes of data. Banks are only using a small portion of this data to generate insights that enhance the customer experience. For instance, research reveals that less than half of banks analyze customers’ external data, such as social media activities and online behavior. And only 29% analyze customers’ share of wallet, one of the key measures of a bank’s relationship with its customers. 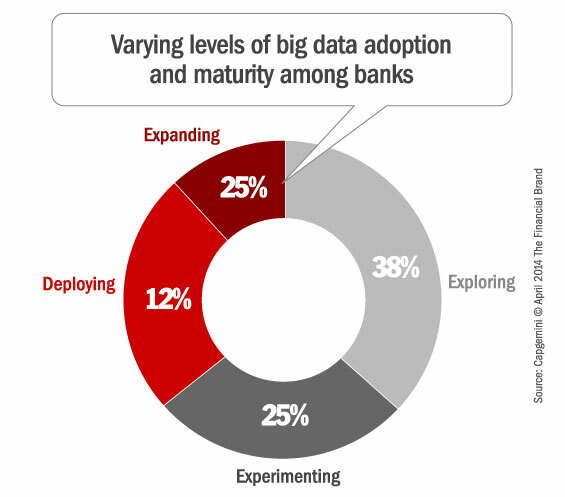 Only 37% of banks have hands-on experience with live big data implementations, while the majority of banks are still focusing on pilots and experiments. Capgemini research shows that organizational silos are the single biggest barrier to success with big data. A dearth of analytics talent, high cost of data management, and a lack of strategic focus on big data are also major stumbling blocks. Customer data typically resides in silos across lines of business or is distributed across systems focused on specific functions such as CRM, portfolio management and loan servicing. As such, banks lack a seamless 360-degree view of the customer. Further, many banks have inflexible legacy systems that impede data integration and prevent them from generating a single view of the customer. Big data requires new technologies and processes to store, organize, and retrieve large volumes of structured and unstructured data. 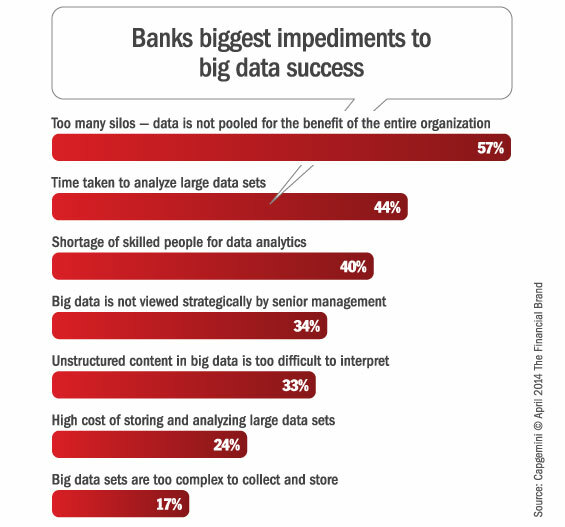 Traditional data management approaches followed by banks do not meet big data requirements. For instance, traditional approaches hinge on a relational data model where relationships are created inside the system and then analyzed. However, with big data, it is difficult to establish formal relationships with the variety of unstructured data that comes through. Similarly, most traditional data management projects view data from a static and/or historic perspective. While most IT projects are driven by the twin facets of stability and scale, big data demands discovery, ability to mine existing and new data, and agility. Consequently, by taking a traditional IT-based approach, organizations limit the potential of big data. In fact, Capgemini says an average company sees a return of just 55 cents on every dollar that it spends on big data. Deutsche Bank has been working on a big data implementation since the beginning of 2012 in an attempt to analyze all of its unstructured data. However, problems have arisen while attempting to unravel the traditional systems — mainframes and databases, and trying to make big data tools work with these systems. The bank has been collecting data from the front end (trading data), the middle (operations data) and the back-end (finance data). Petabytes of this data are stored across 46 data warehouses, where there is 90% overlap of data. It is difficult to unravel these data warehouses that have been built over the last two to three decades. The data integration challenge and the significant investments made by the bank in traditional IT infrastructure pose a key question for the bank’s senior executives – what do they do now with their traditional system? They believe that big, unstructured and raw data analysis will provide important insights, mainly unknown to the bank. But they need to extract this data, streamline it and build traceability and linkages from the traditional systems, which is an expensive proposition. Reality Check: If a bank the size of Deutsche — one of the biggest banks on earth — struggles with big data, you can be sure that most smaller institutions will face even greater obstacles. How Can Banks Realize Greater Value From Their Data? Customer data analytics has been a relatively low priority area for banks. Most have concentrated their energy on risk management, not using analytics to enhance the customer experience, Capgemini says. But their research shows that banks applying analytics to customer data have a four-percentage point lead in market share over banks that do not. The difference in banks that use analytics to understand customer attrition is even more stark at 12-percentage points. Capgemini believes banks can maximize the value of their customer data by leveraging big data analytics across the three key areas of customer retention, market share growth and increasing share of wallet. Maximizing Lead Generation. Big data solutions can help banks generate leads for customer acquisition more effectively. 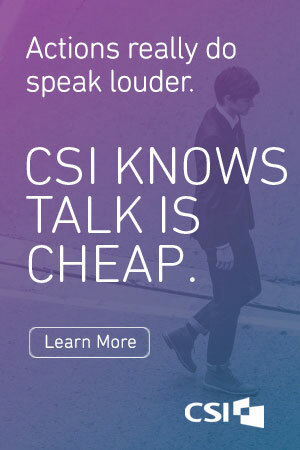 Take the case of US Bank, the fifth largest commercial bank in the US. The bank wanted to focus on multi- channel data to drive strategic decision- making and maximize lead conversions. The bank deployed an analytics solution that integrates data from online and offline channels and provides a unified view of the customer. This integrated data feeds into the bank’s CRM solution, supplying the call center with more relevant leads. It also provides recommendations to the bank’s web team on improving customer engagement on the bank’s website. As a result, the bank’s lead conversion rate has improved by over 100% and customers receive an enhanced and personalized experience. The bank also executed three major website redesigns in 18 months, using data-driven insights to refine website content and increase customer engagement. 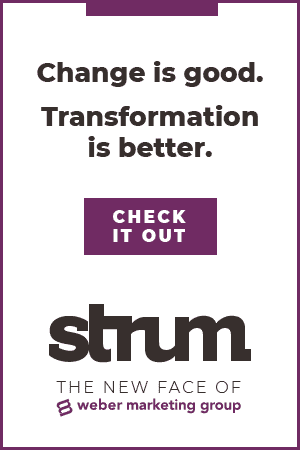 Next Best Action Analytics Models Unlock Opportunities to Drive Top Line Growth. From “next best offer” to cross-selling and up-selling, the insights gleaned from big data analytics allows financial marketers to make more accurate decisions. Big data analytics allows banks to target specific micro customer segments by combining various data points such as past buying behavior, demographics, sentiment analysis from social media along with CRM data. This helps improve customer engagement, experience and loyalty, ultimately leading to increased sales and profitability. Predictive analytics can improve conversion rates by seven times and top-line growth ten-fold. Capgemini studied the impact of using advanced, predictive analytics on marketing effectiveness for a leading European bank. 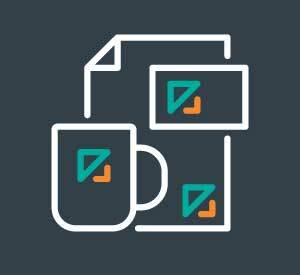 The bank shifted from a model where it relied solely on internal customer data in building marketing campaigns to one where it merged internal and external data sets and applied advanced analytics techniques to this combined data set. 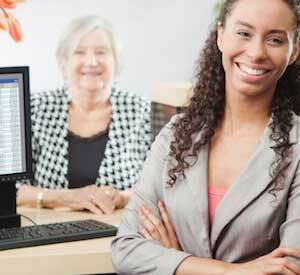 As a result of this shift, the bank was able to identify and qualify its target customers better. Big data Analytics Helps Banks Limit Customer Attrition. A mid-sized European bank used data sets of over 2 million customers with over 200 variables to create a model that predicts the probability of churn for each customer. An automated scorecard with multiple logistic regression models and decision trees calculated the probability of churn for each customer. Through early identification of churn risks, the bank saved itself millions of dollars in outflows it otherwise could not have avoided.